April 24, 1915, was the beginning of the slaughter 1.5 million Armenians by the Ottoman Empire in what is now Turkey. This set a dangerous precedent that has been copied and expanded upon by later despotic governments. Despite its morbid place in world history, governments around the world, including major international powers, refuse to acknowledge that it ever happened. PKK fighters driving a tank into Shingal. The town of Shingal (in Kurdish or "Sinjar" in Arabic) in Iraq's Nineveh Province was declared liberated from ISIS forces, which had held the town since last year, on November 13. The town is mostly inhabited by the Kurdish religious minority community of Yazidis. The town was liberated by Iraqi Kurdish forces, fighting alongside Yazadi militias and fighters from the left-wing Turkish-based Kurdish Workers Party (PKK). The Turkish government has declared all-out war against the residents of the Kurdish-majority town of Silvan (Farqin) in Diyarbakir (Amed) province. The town has been under curfew and siege since November 2. Artillery and military aircraft have been deployed by Turkish military and paramilitary forces. Residents have reported Arabic-speaking bearded terrorists — presumed to be ISIS — taking part in the attacks. Hopes that such government violence would end after the November 1 Turkish elections have been shattered. Kobanê needs the world. The world needs Kobanê. Peter Boyle speaking at World Kobanê Day rally, Sydney, November 1. Peter Boyle gave this speech on behalf of Socialist Alliance at the Sydney rally for World Kobanê Day on November 1. I am here to bring you greetings from the Socialist Alliance and the progressive newspaper Green Left Weekly. Tens of thousands of people have rallied worldwide to demand greater international support for Kurds battling the Islamic State of Iraq and Syria in the largely Kurdish territory of Rojava in northern Syria. Kobane is a Rojavan town that was the scene of prolonged and devastating conflict between the Rojavan revolutionary forces and ISIS, before finally being liberated in January. The battle for Kobane became symbolic of the Rojavan struggle against ISIS and its allies, such as the Turkish state. 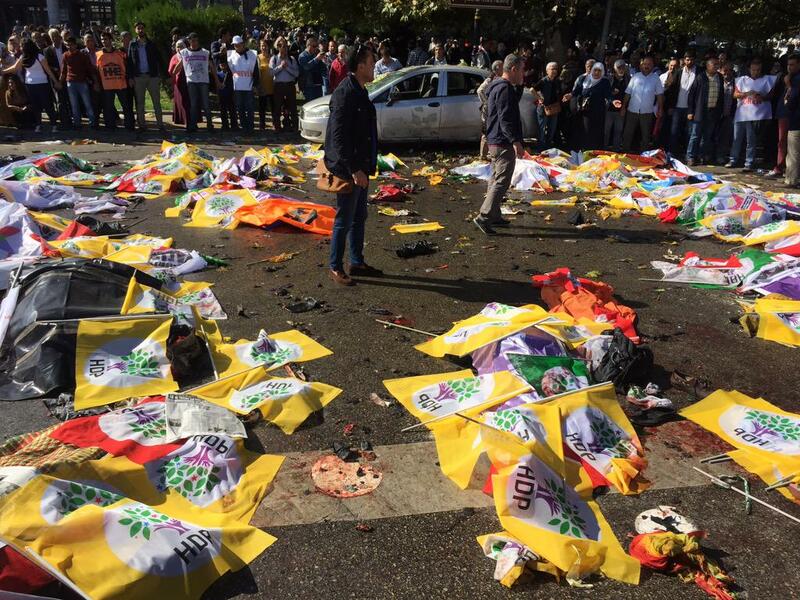 Erdoğan’s electioneering: aftermath of October 10 bombing in Ankara. In Turkey’s November 1 election, Recep Tayyip Erdoğan’s Justice and Development Party (AKP) increased its votes from 41% to 49% in the five months (143 days) from the election in June. The AKP won a majority of seats — 317 out of 550. İlham Ehmed is a member of the Executive Committee of the Movement For A Democratic Society (TEV-DEM), the leading political movement in the self-governing cantons in Rojava (Syrian Kurdistan). She was interviewed by Günay Aksoy and Zana Kaya for Özgür Gündem on October 26. Turkish Prime Minister Ahmet Davutoglu has confirmed that Turkish forces attacked Kurdish militia in northern Syria on October 25, Morning Star said on October 28. The Kurdish People’s Protection Units (YPG) said the next day that its forces in the border town of Tal Abyad had come under machine-gun fire from across the frontier in Akcakale. One year ago, the Islamic State of Iraq and Syria (ISIS) began its brutal assault on the city of Kobane in the largely Kurdish region of Rojava in the north of Syria. The violent fanatics were seeking to destroy the profoundly democratic, multi-ethnic and feminist revolution under way in the liberated autonomous region. The report said some of these alleged abuses were war crimes.